The Last Witch Hunter Review: Vin Diesel Talking Is The Reason We Can’t Have Nice Things. Approximately 5000 years ago, I made a post for the Zoo. It’s been way too damn long and I miss it; so naturally, I’ve come skipping/hopping/twerking back, with a review for all you lovely readers! I recently had the opportunity to see Vin Diesel’s latest action flick, The Last Witch Hunter, and lo and behold, I left the cinema unimpressed and nonchalant AF. This latest attempt at a cool fantasy-action flick has left me feeling all kinds of snarky and sassy; so get ready for a review fit to bursting with both! Anywho, back to ‘Witch Hunting with Vin Diesel the Great and Mighty’. The general gist of this movie, in case it wasn’t already obvious by its very subtle marketing campaign, is that Vin Diesel, an ogre of a man with a neat, yet somehow unkempt appearance, is The Last Witch Hunter™. There’s apparently a mass shortage of hunters because, in 800 odd years, no one thought it’d be a good idea to train up some new recruits. Or something like that, I guess. He does so, back in ye olden days, where men trekked great distances with axes, axes, and also axes as the only weapon against an entire coven of Witches. Witch: A woman thought to have evil magic powers, popularly depicted as wearing a black cloak and pointed hat, and flying on a broomstick. Aaaand you brought an axe? She curses him with immortality. She curses him with the ability to live forever. Curses. Ability to live forever. Sooo, the only reason you’re The Last Witch Hunter™ is because old demon-zombie cursed you….not because you’re like, the best?? And of course, Kaulder (in disguise as Vin Diesel), saves the day but does not kill the Witch, because he’s so much of a badass, he can like, kill or not kill Witches as and when he pleases…or does not please. The rest of the movie follows this pattern of, “GAH WHO WILL SAVE THEM. WHO WILL KILL THE BAD GUYS. WHO, GOD, WHO”. And adds in an annoying amount of “Cocky main character who bloody well knows everything and anything”. So what is even the point of tertiary characters like the one played by Rose Leslie??? Leslie plays a beautiful witch, with a charming English accent, who doesn’t actually know how to Witch. I mean, the movie literally makes a massive point of ensuring we know it’s Kaulder who’s protecting her. You know, even though she’s supposed to a be a goddamn witch and actually has a little pep in her step when we first meet her. She starts off with a fiery personality, showing her bravery by standing her ground when Kaulder steps foot in her bar, as opposed to literally running off like every single member of her staff did. Of course, that goes out the window once she takes her place as Female Sidekick™. Naturally, in this role, she’s not allowed to have a any bright ideas or do anything too amazing and insightful, lest she take away from her male counterpart. Which, in this case, happens to be a pretty big name in the world of action movies; so, of course, she’s even more useless than she would be in a normal action film. Overall, The Last Witch Hunter wasn’t just an abysmal mess. It was also a colossal failure with no silver lining. Sure, the effects were cool-looking, but not cool enough to leave you in awe akin to say, Pacific Rim. Vin Diesel, surrounded by unnecessary and insignificant characters, fails to capture audiences with his portrayal of Kaulder, because lo and behold Kaulder isn’t a likeable character. When you know everything and can’t help but tell every living thing with a heartbeat that you’ve “seen some sh*t, and done some sh*t”, you don’t make the audience want to root for you. Not even a little bit. If I had to give it a score out of 10, I’d probably go with a very poor 4/10. 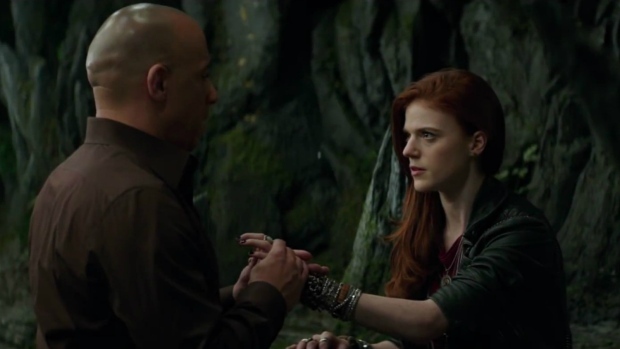 Tags: Action Movies, Christina Tenisha, Fast and Furious, Furious 7, Hansel & Gretel: Witch Hunters, Movies, Review, Rose Leslie, The Last Witch Hunter, Vin Diesel. Bookmark the permalink. Im okay with not watching it, then. Lol, great review. Definitely giving this one a miss.